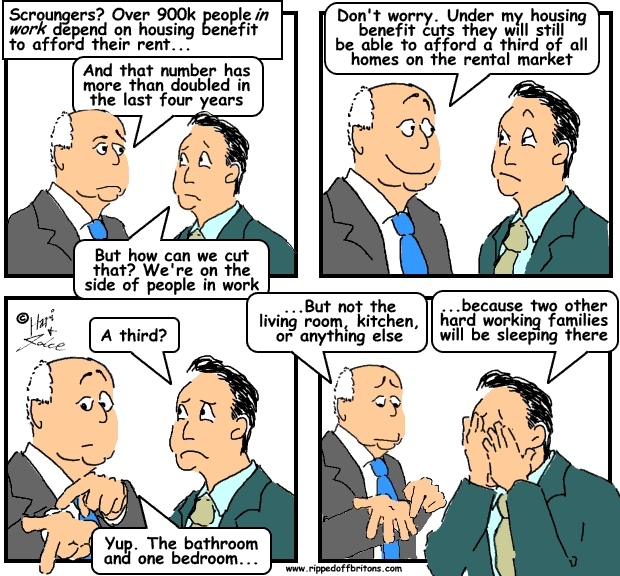 Liebrary: Cutting benefits will push the work-shy into employment? Actually benefits subsidise the low wages of millions of working Britons. More evidence that benefits subsidise business comes from the report by Queen Mary University of London. "The functioning of our great city relies on the work of many who carry out its essential functions on a daily basis – from office cleaners to care-workers in social services. It is right that their skills and commitment to London’s success are recognised, and one of the most fundamental ways of doing this is to ensure that all Londoners are paid properly. That means receiving at least the ‘London Living Wage’, which is designed to provide a minimum acceptable quality of life." This same GLA report set the London Living Wage at £8.30 per hour. The gap between the 2011 National Minimum Wage of £6.08 per hour and the London Living Wage in 2011 is £2.22. 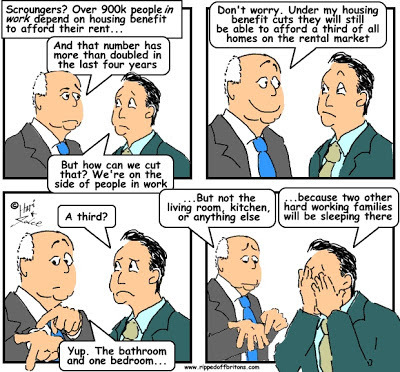 However, the London Living Wage assumes that on top of the £8.30 per hour the worker is also receiving benefits. According to the Queen Mary University report, without benefits the worker would need £4.32 per hour more - a 71% increase. So businesses in London and other major towns and cities can save on their running costs thanks at least in part to the taxes paid by people right out in the heart of the country who won't see any benefit. What do businesses do with their excess profits, profits they wouldn't have if it weren't for this surely inadvertent subsidy from the taxpayer? It seems reasonable to assume at least a measure of it is put it into tax havens, taking it out of circulation. How antisocial is that? Isn't this just another way of impoverishing the taxpayer to unfairly enrich company CEOs? Who voted for this? However, I think it is reasonable for businesses to pay market rates, even if they are very low. It's not a corner shop owner's responsibility to pay a 'living wage', he should just to pay a reasonable share of his profit. If the employee can get more somewhere else, then he should go. But if we want to live in a society without hunger and homelessness, then society needs to provide the top up in the form of benefits. Alternatively, take (collective) action to raise the market rate. If some businesses consequently struggle, they were propped up by taxes and a direct subsidy would be more transparent and possibly cheaper. Should not be allowed to become an opportunity for capitalists to buy up failing businesses and exploit their captive market. Every business owner needs to understand that every employee needs to earn a living wage. That has to be factored into every business equation. If not, who will be buying any produce? A business is part of a community, not set apart from it. It has to enable customers not simply serve them. This is a basic business responsibility to any commuity it hopes to profit from. A business has to give as well as take. If no business is giving then none can be taking. Any other attitude is socially irresponsible, ignorant and ultimately self-defeating.